BARACK Obama was told to "burn in hell" by Russian activists who unravelled a giant banner outside the US embassy on Tuesday. 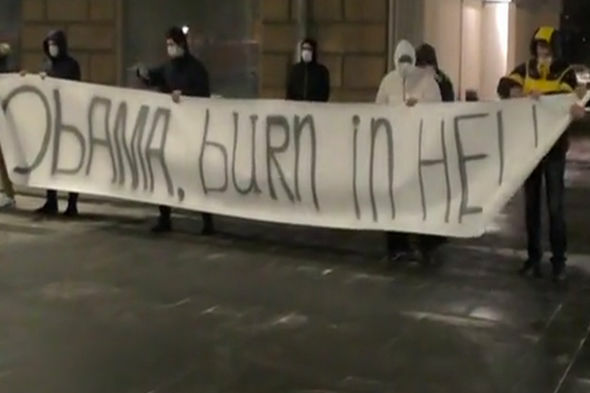 Activists unfurled a banner reading 'Obama burn in hell' in front of the US Embassy in Moscow, Tuesday. They fired flares before setting the canvas on fire. As the president prepares to step down from his post, not everybody was prepared to give Mr Obama’s eight years in office a glowing send-off. Amid heightening tensions between Russia and US the group of protesters can be seen holding the long sign outside the embassy in Moscow. The video shows the gang of 10 men running into the view of the camera, all wearing white face masks. Protesters unravelled a banner inscribed "Obama burn in hell"
Two of the group then grab either end of the large scroll and begin to uncover what is written on it. The words “Obama burn in hell” can be seen as the sign is unfurled on the streets of the Russian capital. 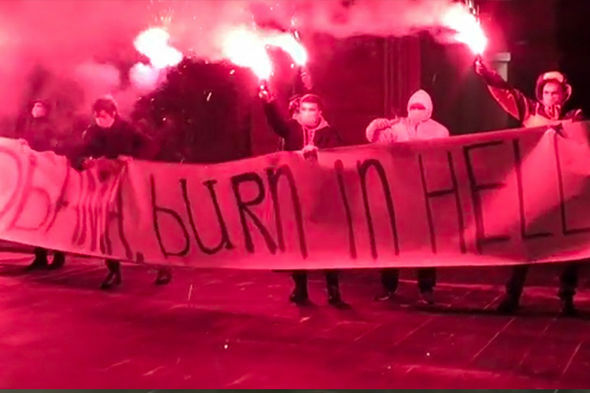 The footage, uploaded by news service Ruptly, shows the activists begin to light red flares as they begin to chant in protest of the out-going Obama administration. As the flames begin to burn out, the masked men chuck the banner on to the floor before setting the canvas on fire. 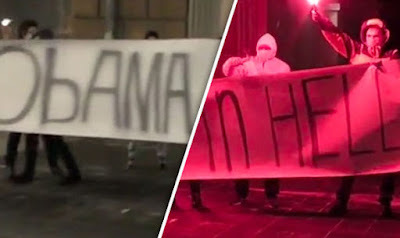 The gang were members of the art group “Federals” and had staged the protest to express their disagreement with the policies of Mr Obama, according to RT. At the end of the 47-second video, the men disperse in the same direction they had come from, leaving the banner behind. On Friday Barack Obama will make way for president-elect Donald Trump – after the Republican’s crushing victory over rival Hillary Clinton in November. There has been no love lost between President Obama and Russia’s Vladimir Putin over the years. 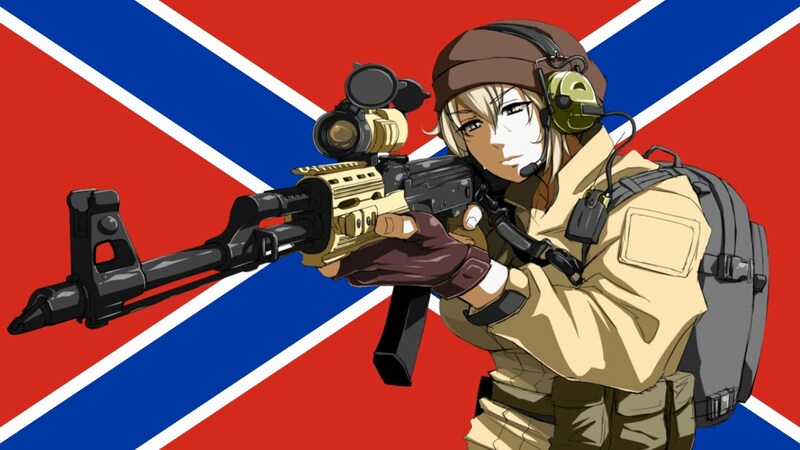 The relationship between the two superstates has come under strain with some likening it to a “new Cold War”. Tensions increased further in recent weeks after Mr Obama ordered sanctions against the Kremlin as punishment for its alleged hacking interference in the US election. President Obama kicked out 35 Russian officials in revenge of the reported hack - described by Mr Putin as “irresponsible diplomacy”. There is hope that with relations could soon be resurrected over the coming months as Mr Trump looks rebuild ties with Russia. Russia’s president said he would not retaliate to the American sanctions and instead will “make further steps to help resurrect Russian-American relations based on the policies that the administration of Trump will pursue".